In Japan, November 15th is the day of Shichi-Go-San (7-5-3), when children who will reach turn 3 or 7 (girls) or 3 or 5 (boys) in the next year dress up, go to a shrine, and pray for happiness and long life. My son will be 5 next year, and my daughter and niece will be 3 this year, so we celebrated 7-5-3 for the first time. In our case, since my husband's family is Buddhist and I am an atheist, we decided against going to a Shinto shrine. Okay, mostly it's that we are cheap, and buying/renting traditional gear, paying someone to put it on and do Domba's hair (aka attach a wig), and then paying the Shinto shrine to bless the kids, was not something we'd like to spend money on. More traditional families spend a day on the weekend previous to 7-5-3 going to a close Shinto shrine for these blessings. There are alternative blessings at some Buddhist temples, depending on how strict a sect is. Some, like the one my in-laws belong to, refuse to accept Shintoism, although most Japanese people celebrate occasions at both a Shinto shrine (for lucky charms, new beginnings, weddings, births, New Year's Day) and a Buddhist temple (for endings, deaths, and remembrance ceremonies). The parents dress in suits (don't forget the pearl necklace!) and the kids dress in kimono for girls or hakama for boys (or black western formalwear). 3-year old girls wear a hifu, a little padded vest, while 7-year old girls wear an obi for the first time. I really like rite of passage traditions. This one came about because samurai's children kept their head shorn until they were around 3, and then went to the shrine to be purified and receive a blessing for a long life. In those times getting to the age of three was cause for celebration. Although we didn't do the religious part of this ceremony, we took pictures in various kinds of fancy dress, went out for a celebratory meal, and the kids got candy. The traditional candy is called chitose-ame (thousand-year candy), which are long milky white candies. They taste kind of like chalk, but come in a pretty paper bag with a handle, with turtle designs (as turtles live long). They also got some snacks they like. ;) You can see the bag in the picture below. 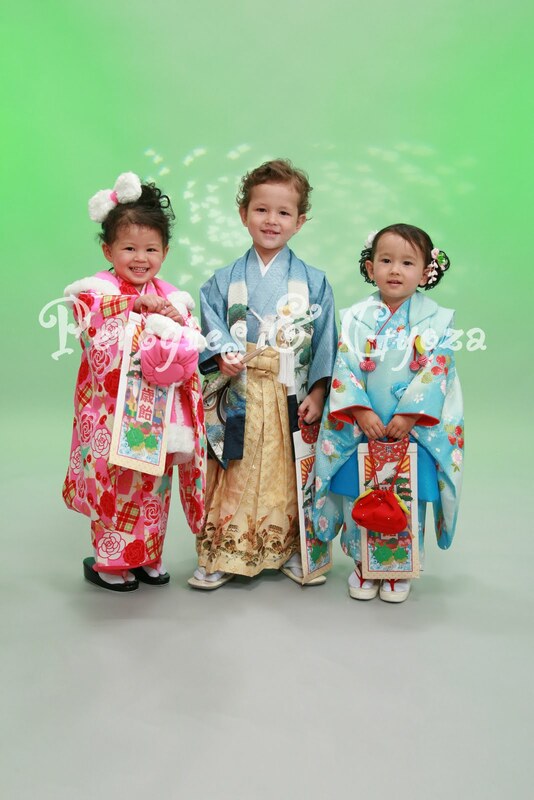 The kids look so cute in their traditional japanese costume. Gorgeous pic! They all look beautiful, what a great memory! Thanks for the compliments! It was a great day, and these pics are great memories.